Musings of a Wandering Heart. . . Above lines perfectly depict the state of Ghalib’s life post 1857 uprising which not only caused him the loss of friends and propriety but also (more importantly) shattered his soul from within making him lose all the hope for better times. He was pushed into the state of loneliness and solitude so much so that in the last years of his life he was primarily confined to his house only with minimal or no visitors. In his own words, “I have the grief of death, grief of partings, grief of livelihood, grief of reputation. The death of my near ones and separation from my living friends have plunged my world in utter darkness.” He was physically debilitated and emotionally drained losing the desire to live, just waiting for his time to arrive for the absolution that was never reached. 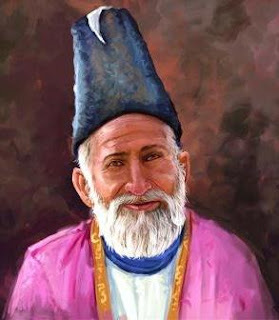 “Mirza Sahib, I can sense the agony and torment in your voice as you recall the year of India’s first freedom struggle. It was really disheartening to hear about your brother Yusuf. But then if there is one thing that’s still remains inexplicable, it’s the inevitability of death & its timing. The bond we share with our near and dear ones is such that even the slightest of the thought of their separation is haunting to the soul.” I tried to console him. “I knew you loved Delhi a lot and your soul actually resided in those markets and by-lanes & as the city suffered from the ravages of the British in suppression of the oppression, a part of you died. But why didn’t you leave the city when everything you owned or ever earned was lost?” I asked. The above verses of Ghalib made me silent and I struggled for the words to come out of my mouth. These were originally written by Ghalib in the aftermath of riots and rampant in Delhi. His distress and anguish is clearly visible in above verse wherein he longs for the solitude to shun away the sophistications of newly formed Delhi. But Delhi for him remained like an albatross around the neck, something which he could crib about but could never leave. “But I couldn’t leave son, I just couldn’t leave. This heart is a strange fellow, no matter how cruelly your lover betrays you it will remain longing and loyal for it. Even though this city turned ungrateful towards the end, my heart stood longing for it and its love put shackles on my feet – it was hard for me to stay but even harder to move on” he heaved a deep sigh. “I am sure it was son. My life was burdened with one wife, two children (of distant relatives) and three servants to take care of. Ghumman Mian, another faithful servant of mine, who has gone away for some time also returned back post the revolt wearied and depressed with poverty and impoverishment. You asked me a while ago, why didn’t I leave? Tell me son, how could I leave when I had twenty mouths to feed with not a paisa in my pocket?” he said. 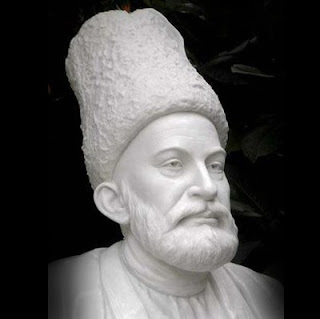 After a protracted illness, followed by a state of coma, Miraz Ghalib breathed his last on Feb 15 1869. He was buried in central Delhi’s Nizamuddin Basti, in the family graveyard of the Nawab of Loharu. His wife died on the same date, a year later. His words came true and the fame, recognition and praise came to him posthumously. Mirza Sahib stood silent and I was constantly staring at him. It was an emotional journey to share and know about Mirza Sahib’s life and to revisit some of the long forgotten pages again with him. It must have been emotionally draining for him and for me too, it was an intense experience to be a part of his journey. The stream of emotions which I was holding inside me for the last few hours was getting heavier and heavier. I could feel the lump inside my throat and the emotions swamped my eyes. I was certain that it’s just a matter of moments when this dam would be broken and the lump & emotions would be flown out – I was fighting within to hold that dam intact. I grew silent and just turned my face away. Mirza Sahib, perhaps, sensed my emotional turmoil and said, “Son…” He repeated it twice before placing his hand on my shoulder. “Is it? Do you really have to leave? Is it not possible for you to stay a bit longer? Throughout our discussions it never occurred to me that the time for leaving would ever arrive. I hate saying goodbyes especially when the heart desires to spend more moments and the mind doesn’t want to forget. Please don’t go, if there is even the remotest possibility to do so.” I said. “Son, I had gone already more than a century and half back. It was you who made me come back to tell you my story and now the story is up so is my time. But this time I am going with a fulfilled heart and content soul. You know when I was alive there so much of negativity surrounding me that I always aspired to be devoid of any funeral or tomb so that the no one get any chance to indulge in any kind of indiscreet and unflattering talk about me. That way I would have saved myself from ignominy post my death” he said. (Disgraced as I have been after my death, why didn’t I drown in the sea? He went pensive as he said those words. I couldn’t help but gazing at him constantly. His grey beard was shining silver in the backdrop of the dim light in the bus and his conical cap was gracing his head as elegantly as ever. Time can never be consistent, it sometimes crawls like a snail and sometimes flies like a bird. That day it appeared to be on a flying spree. No sooner did we realize the moment of eventual separation is approaching, it came. The bus stopped at the depot in the Delhi and the incumbents rushed out of the bus in a hurry – some must were wearied and exhausted from the long bus journey while others were enthused to meet their kins and mates. “Arre bhaiya, please come down. We also have to go to home” the conductor said pointing to me. His voice made me realize that all the passengers save us have got down from the bus. Most hesitatingly, we got up and moved towards the gate. We were the last to disembark – Me and Mirza Sahib. “Khudaa Hafiz son. Assalamu alaikum wa rahmatullahi wa barakatuh (Good Bye Son. May the peace, mercy, and blessings of Allah be with you)”, Mirza Sahib kissed my forehead, placed his hand on my head and turned away. “Mirza Sahib,” I called him and bent down to touch his feet with my eyes closed, perhaps I didn’t want to let this moment pass from my glance. “Bhaiya, have you lost something? What are you searching for there?” the bus conductor asked. Leaving him amused, I took my bag along-with those scattered bits of moments just elapsed and left the place. As I walked, Mirza Sahib’s hoarse voice echoed in my ears. . .
Its all about sharing life's snippets here at Musings of a Wandering Heart. . . Your thoughts on the post are awaited & would be highly appreciated. The Musings Include. . .
© Manish Purohit (Reserved). Powered by Blogger.